STUART HOGG WILL sit out Scotland’s Six Nations clash with Grand Slam hopefuls Wales at Murrayfield on Saturday. Glasgow Warriors fullback Hogg sustained a shoulder problem following a challenge from Peter O’Mahony in the 22-13 defeat to Ireland on 9 February. Gregor Townsend welcomed the return of five previously injured players to his squad ahead of this weekend’s match, but Hogg was not among them. 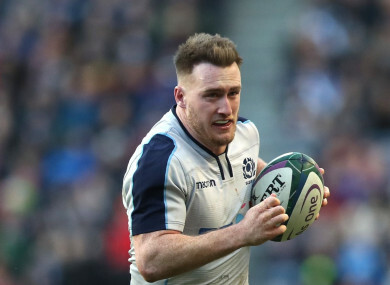 A Scottish Rugby statement read: “Full-back Stuart Hogg will not join the squad in the camp this week as he is not being considered for this Saturday’s game against Wales, following the shoulder injury he sustained against Ireland in the second round of the championship. However, out-half Finn Russell is in line to return after playing 65 minutes in Racing 92′s 50-14 win over La Rochelle on Saturday. Russell sustained a head injury while in Top 14 action on February 17 and consequently missed Scotland’s 27-10 victory over France the following weekend. Hamish Watson, WP Nel, Sam Skinner, Stafford McDowall and Grant Stewart have all returned to the Scotland set-up, with Matt Fagerson, Byron McGuigan and Gordon Reid added by Townsend. George Horne, D’Arcy Rae, George Turner and Chris Dean drop out due to injury, while Alex Allan, Rob Harley, John Hardie and Duncan Weir have been released back to their clubs. Email “Russell back in contention for Scotland but Hogg ruled out of Wales clash”. Feedback on “Russell back in contention for Scotland but Hogg ruled out of Wales clash”.